This ridiculous piece of nonsense published by Labour Uncut during the election campaign made me very angry. Suggesting Labour were on course to lose 90 plus seats "based on the views of dozens of Labour candidates, party officials and activists following the past three weeks of intensive canvassing", it was a demoralising piece designed to demoralise and demobilise. Yet it was scrolling down and reading the section on Scotland that truly incensed me. It (correctly) projected Labour were on course to increase its representation in Scotland and, indeed, managed to exceed their forecast of four seats by returning seven MPs to Westminster. But it was the politics adopted that were deeply worrying. It argues that Ian Murray, Labour's sole survivor from the 2015 wipe out had urged voting tactically for the Tories to keep the SNP out. Yes, you read that correctly. An errant comment, perhaps? No. The entirety of the Labour Group on Aberdeen Council were suspended for forming a coalition with the Tories to prevent the SNP from forming an administration, and Our Kez herself matter of factly noted there were some seats where the Tories were better placed to defeat the SNP. What a show. What a scabby, sorry show. Cast your mind back to 2015. Everyone knew the SNP earthquake was coming and it turned out to be bigger than supposed. 56 out of 59 seats. The 'Westminster parties', as Nicola Sturgeon likes to call them, were confined to a single seat apiece. And the reasons why Scottish Labour imploded are well known. A rotting apparatus that viewed its constituents as mindless voting fodder, happily cosied up to the Tories in the awful Better Together campaign during the independence referendum and repeating their attack lines. Can you remember Ed Balls appearing alongside George Osborne and telling Scottish voters the UK would screw an independent Scotland? Because, yes, that happened and the wiseacres in London and Edinburgh thought nothing would come of it. How incredibly stupid can you be in a country where anti-Tory sentiment is a key part of the Scottish national character for a great many people, for a great many Labour voters? Therefore, to find Scottish Labour doubling down on what smashed them to bits is eye-clawingly idiotic. I know why they did it. For Labour Uncut it was a masterstroke. "Savvy" campaigners had cottoned on to the electoral opportunities of riding the anti-independence vote, just like Ruth Davidson. And how can you argue with the results? I for one am going to damn well argue with the results. As Lesley Brennan from the Campaign for Socialism notes, for all the nous and sensible, sensible politics pushed by Our Kez Labour managed an uptick of fewer than 10,000 votes across Scotland. Labour didn't so much win its seats as the collapse of the SNP's support lost them. Would things have been different had Scottish Labour run a Corbynist campaign? Absolutely. The sociological character of the 2015 earthquake would have guaranteed it. The movement called into being by the yes campaign was certainly nationalist, but that wasn't its most important feature. The people activated by independence were more than pissed off Labour voters, it was a large number of people from across the demographic spectrum, and a great many were motivated by the hopes they projected onto an independent Scotland. A country free from the Tories, and therefore free of dog-eat-dog, of remote, corrupt elites calling the shots, of cuts and privatisation, of insecurity, and of scaremongering and division peddling. And, of course, the young were the most enthusiastic and most numerous end of the pro-independence movement. Hmmm, where have we witnessed a very similar movement of late? As suggested last year, Corbynism and the SNP surge were part of the same process working its way through British politics. Why Scottish Labour is the one part of Britain where the party hasn't recruited hand over fist isn't just because of its unique awfulness, but because the most active part of what should be our constituency - the growing number of socialised/networked workers - is ensconced in and largely support the SNP. Yet there is something of a mercenary character to this affiliation. Large numbers of left wingers in Scotland think independence is the way forward. I think that is badly mistaken and cuts against the realignment of class politics, but nevertheless it is a clear, principled position. However, many people voted for independence and got on the SNP's bandwagon because, for them, independence was the best vehicle for a socially just society. Despite that, two years on there is little evidence of grassroots radicalism working its way through the SNP's structures and changing its politics. The Scottish government have carried on as a social democratic-lite administration without many triumphs, but with an education system in such a state the Tories felt emboldened enough to go hard on it. They also gave the impression that independence is the be-all and end-all, regardless of circumstances, by trying to spring a second referendum when there is little appetite for one. To some it looked like a transparent attempt by Sturgeon to focus politics on independence to the exclusion of scrutiny on the party's patchy record in power. Second, and perhaps more importantly for the SNP in the short to medium term was losing 12 seats to the Tories, including Alex Salmond's and Angus Robertson's. The idea the SNP are an effective anti-Tory machine has been shattered. In the period of Scottish Labour's dominance, regardless of what you thought of them they managed to keep the Tories down. Two years into the SNP's supposedly stronger grip on Scottish politics and the Conservatives bounce back with their best result for over 30 years. Meanwhile south of the border Corbynism defied expectations and took seats from the Tories on a manifesto well to the left of what the SNP stood on. If it wasn't for the nationalists retreating then Theresa May would be gone and politics would be even more interesting. Therefore, just as Jeremy Corbyn has saved the Labour Party in England and Wales from the fate of the centre left elsewhere, it is a matter of urgency Scottish Labour drops the zombie Blairism and the cretinous toadying of the Tories in the name of unionism. Corbyn and Corbynism has to have its opportunity to save the Scottish party too. It must strike out for the new ground represented by the rising socialised worker. If not, Scottish Labour is doomed. It really is as simple as that. Corbyn refused to get involved in a spat with his Scottish branch office and acted with enormous magnanimity in victory." "In England Labour’s vote was up by 41%, in Wales by 40%. In Scotland, meanwhile, under the apparently brilliant leadership of Kezia Dugdale and helpfully starting from an all-time low, Labour’s vote increased by just 1%, from 707,000 to 717,000." The context is a Daily Record article rubbishing Scottish members publishing an analysis along these lines. IMO, Labour has to grasp a nettle. Complete independence for SLAB, or knock it on the head. Of course, the sum total of human knowledge would be served if you could offer a criticism and explain why it's "a load of rubbish". But you can't because we both know the analysis is correct. As an SWP and local govt trade union activist in Scotland, I think Phil's analysis is very accurate. Labour comrades really need to work hard to win the Scottish Party away from its stubbornly unionist and blairite image. The attraction of Corbynism is only slightly weakened by his stance against independence but it is very muffled by the pernicious Blairism of the Scottish Labour leadership. Mind you, the task is far from complete in England either. Although much of the left (including many labour supporters) saw the recent independence movemement (whose motivation for many is well described by Phil) as a way forward, some of us are far from seeing it as the (only) way forward. As a Scot who is a long-time socialist – (at present I am a member of the Socialist Party Scotland) - and has lived the majority of his adult life in the south-east of England and only returned to Scotland 7 years ago which meant I was never involved directly involved in the events around the formation, rise and fall of the Scottish Socialist Party I feel that there needs to be a socialist policy for Scotland considering that the capitalist SNP government is carry-out the wishes of Scottish and British capitalism by instituting their austerity programme. As we know globally 8 people own as much as the poorest half of humanity along with the biggest gap between the rich and poor in all human history; the reality is the majority of us working class, and I may add the middle class as well, face austerity while the rich are raking it in. Here in Scotland the richest 1% owns more wealth than the poorest 50% and Scottish corporations which have ties to the 125 top corporations dominate circa 85percent of the British economy. Hence their hostility to Jeremy Corbyn because the capitalist dominated SNP Government is under threat from a socialist resurgence from the Scottish working class. The problem with Scottish Labour is they are dominated with Blairite clones and to be honest the Scottish Labour Left while well-meaning are not prepared to openly challenge the Blairite Dugdale-esque leadership. That is partially due to the disastrous decision to unite with the Tories in the Better Together NO campaign in the 2014 Scottish referendum and the tacit implications of continuing that point of view in the 2017 general election. That along with the Blairite/Brownite counter-revolution over decades inside the Scottish party has meant an up-hill struggle for Jeremy Corbyn. But where Jeremy Corbyn, the Labour Left in general, and the Scottish Labour Left specifically are mistaken is not to take stock of the national question in Scotland and blame everything on the SNP and the headbanger nationalists. There is a genuine democratic desire of a big section of the working class and young people of Scotland who look to independence as a means to get out of the capitalist misery they are suffering. That can only undermine support for the left-wing Jeremy Corbyn and the Labour left in general. I believe it is the role of socialists in Scotland to support the desire for independence – which in the polls since the 2014 Referendum have been around 45 percent support for independence, so that is a significant minority – while at the same time explaining the need to carry through a rupture with capitalism and fight for the socialist transformation of society. For the Jeremy Corbyn Labour party to capitalise in Scotland as a minimum Corbyn and the Labour Left should make it clear that they will support the right to a second referendum on independence and then demand that the Labour MPs in Westminster vote in favour of a Section 30 Order to put a legally binding referendum in place. 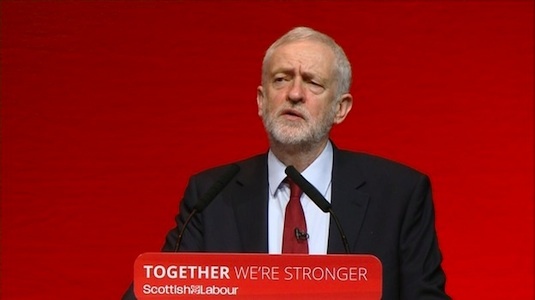 Jeremy Corbyn and the Scottish Labour Left should initiate a democratic conference of the Scottish labour movement, open to all trade unions, anti-austerity groups, all socialist groups and individuals and discuss a class approach to the Scottish national question. The Socialist Party Scotland, stands rigidly for the unity of working class and its organisations across Britain while as the same time advocating an independent Socialist Scotland within the framework of a voluntary democratic socialist confederation of Scotland with a socialist England, wales and Ireland as a step to a socialist Europe. Now this is what we would be campaigning for if there was this labour movement conference on the Scottish national question. I believe this would lay the basis for the effective relaunching of a fighting socialist alternative in Scotland that would win huge support and successfully challenge the pro-capitalist, cuts programme of the SNP. I fully agree with the analysis also and I also agree that Jeremy Corbyn`s Labour Party would be more amenable to a 2nd Scottish Referendum. It`s the Tories that need to be kicked out of Scotland again. It was a huge mistake that Dugdale`s so called tactical vote opened the doors to Tories in Scotland again. I did wonder why Jeremy Corbyn didn't campaign more in Scotland. He will need to Campaign at large in Scotland this next time. His speeches are just what many in Scotland need to hear. Hopefully, next time, a Labour Government. For the good of all, not the few.#jc4pm.